As part of The Schoolhouse Review Crew, I received a deck of Notable Novelists cards to review. 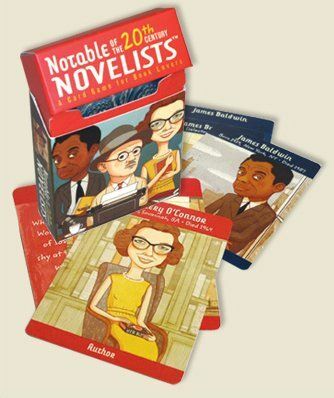 Notable Novelists is a card game for book lovers, ages 12 and up. The cards feature 18 novelists of the 20th century. The Author Card includes the author’s name, portrait and birth/death date. The Library Card includes 3 important books by the author. The Bio Card includes a piece of biographical information about the author. -The rules to play Notable Novelists are very similar to go fish, I think. After dealing four cards to each player, 2 or more players, the remaining cards are placed in a pile face down. 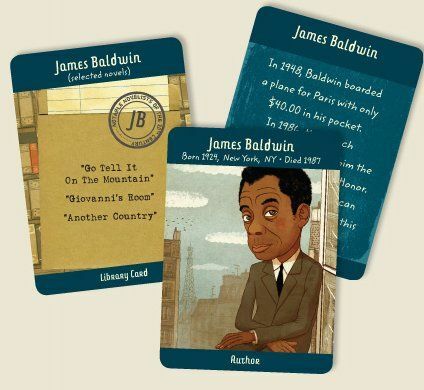 The youngest player goes first by asking any player for one of the three cards for a specific author For example, the would ask for “James Baldwin author card”. If the player being asked has the card, they have to give it to the person asking. If the card completes a set of three, the player lays them on the table, and asks another player for another card. -If the player asked doesn’t have the requested card, you pick the top card from the pile. If the card is the one requested, you show the group and place your Literary Set on the table. -If the card picked doesn’t complete a set, but is the card you requested, you show the other players, place the card in your hand, and request another card from any player. If you do not pick the card you requested, place the card in your hand, and your turn is over. -Play moves to the right, and the game ends when all the Literary Sets have been made. The player with the most sets wins. The instructions include an alternate way to play, also. One player lays out three Author Cards face up for all the players to see. They then read aloud information from the Bio Card or the Library Card. The first player to identify which author the information is about gets to keep the Author Card. Another Author Card is then placed face up on the table with the remaining cards, and play continues until all the Author Cards have been won. We haven’t played this way yet. As we learn more about the authors while playing the first set of directions, we will move on the playing this alternate way. We really liked playing Notable Novelists. Because I’m a book lover, I played along with my kids. It’s an easy, fun game for the whole family. It’s a fun game, and at the same time, an educational game. This card game is a great way to introduce these authors and their works to kids. The instructions say for ages 12 and up. I think ,however, if you have a book lover who is 10 or 11 they would love and benefit from playing this game. Notable Novelists is a great game for book lovers, game lovers, parents, and educators. It would also make a great gift. The Notable Novelists card game sells for $10.95 on The Notable Novelists website.